Barcelona eventually prevailed thanks to some fantastic Lionel Messi play, at the end of a fascinating, high-tempo contest. Luis Enrique continues to use Marc-Andre ter Stegen as his cup goalkeeper, with Claudio Bravo dropping to the bench. Otherwise, the team was as expected. Jeremy Mathieu was ruled out through injury – and it was interesting to see Thomas Vermaelen on the bench following his injury problems – but there were no real surprises, this was Barcelona’s regular outfield starting side. Pep Guardiola, on his first return to the Camp Nou, was still without key players – particularly Arjen Robben and Franck Ribery, who were so devastating in this fixture two seasons ago – but also David Alaba. Guardiola’s team selection was very similar to the XI which started in the cup match against Dortmund last week. The only change was Bastian Schweinsteiger in for Mitchell Weiser, which hinted that Bayern would again use a three-man defence. Not so much a game of two halves – more a game of four quarters. First, Barcelona were dominant in the opening period, then Bayern stabilised the game before half-time but remained on the back foot. After the break, Bayern emerged re-energised and played their best football, but then Messi took charge and put the tie out of Bayern’s reach. From the outset, it was obvious Guardiola had selected a three-man defence – like against Dortmund, Rafinha lined up on the left of the trio. Theoretically, it’s useful to have a right-footer against Messi – although the Argentine would later prove he’s capable of beating defenders on the outside, too. Jerome Boateng was up against Luis Suarez, and Mehdi Benatia versus Neymar. This was, of course, a huge risk against this Barcelona front three. When at Barcelona, Guardiola usually preferred to use a spare man in defence, providing a sweeper if any of his defenders were outwitted by opponents. Here, the risk was huge – if his defenders made a single mistake, or were beaten through trickery from Barca’s front three, the opposition were in on goal. It seemed a hugely dangerous tactic. The one caveat, of course, is that Bayern did have a sweeper, of sorts: their goalkeeper. Manuel Neuer is probably the most astute sweeper-keeper in history, and he made two dramatic interventions in this match when sweeping outside his own box. Why was Guardiola playing three-versus-three? Well, because he wanted resources higher up the pitch, allowing him to press Barcelona intensely. 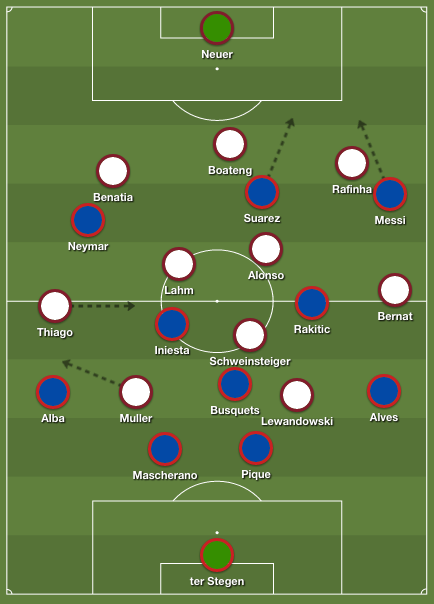 It was difficult to deduce Bayern’s precise formation in the first 15 minutes, because they were so determined to go man-for-man across the pitch, shutting down Barca and preventing them from building up play from the back. Barca usually intercepted the ball inside their own half, Bayern’s interceptions were concentrated more in the middle third. Man-marking is something we’ve increasingly seen over the past couple of years, particularly from this ’school’ of managers like Guardiola, Marcelo Bielsa, Louis van Gaal and Jorge Sampaoli. The Guardiola v Bielsa meetings saw man-marking across the pitch, as did Van Gaal and Sampaoli’s World Cup encounter (in the midfield zone, anyway). Nevertheless, it’s still surprising, confusing, almost difficult to watch because it’s so utterly different from the type of structured, organised matches we’re accustomed to. It was frantic in the opening stages, and Bayern had no control. Their system seemed to involve Juan Bernat playing as a left-wing-back and Thiago Alcantara drifting in from the right, with Thomas Muller also providing right-sided width when necessary. If Bayern were strongest anywhere in the pitch, it was probably deep in midfield where Xabi Alonso appeared the freest player, although it’s still questionable whether the spare player was useful in front of the defence, rather than as part of it. When Guardiola’s Barcelona side were pressed like this, they would continue playing short passes out from the back. Luis Enrique’s Barcelona, however, played longer passes into attack, and the game’s first clear chance came from a long Gerard Pique ball to Messi, who nodded the ball on for Suarez to race in behind. It was the most ‘route one’ Barcelona attack you’ll ever see, and required Neuer to make a good save. You can argue, of course, that this was a simple mistake from Bayern’s defenders – Boateng tried to play offside, with Benatia playing Suarez on – but it’s not possible to separate this from the formation. The entire point is that defenders will sometimes make mistakes, sometimes get turned – the spare man can guard against attackers breaking through on goal under no pressure. It was the second time Suarez had got in behind, incidentally – he’d already fallen to the floor under a clumsy Boateng tackle. After around 15 minutes, Bayern changed system completely. They switched to a four-man defence – roughly with a diamond midfield – a change which saw Rafinha moving all the way across to become a right-back, and Bernat dropping back to become a more conventional left-back. Any kind of defensive shift, especially at such an early stage in a high-tempo game, is a significant decision from the manager – and yet this might have been pre-planned. There was no panic from Guardiola, the players shifted into a different system with minimal communication from the bench, or between each other. Guardiola changed from a back four to a back three at a similar stage at the Bernabeu in 2011 (a change which worked brilliantly thanks to Sergio Busquets’ incredible display) – he was essentially attempting to trick Real Madrid, and maybe he was doing the same here. Alternatively, he desired extremely heavy pressure in the first 15 minutes, but knew that kind of pressure (and no spare man) is unsustainable for 90 minutes, so then gave himself another defender. Or maybe he simply got his starting shape wrong, and adjusted quickly. The game now settled down. Both teams tried to get control in the centre of the pitch, and Bayern coped well in this zone because they basically had a 4 v 3, Bastian Schweinsteiger pressing Busquets, Alonso covering the space in front of the defence, then Thiago and Lahm shuttling to the sides and close to Andres Iniesta and Ivan Rakitic. However, the narrowness is very unlike Guardiola’s Bayern, and Barcelona exploited this by pushing their full-backs forward. Jordi Alba kept receiving long diagonal passes and Daniel Alves turned in one of his best displays of the season, powering forward like the Alves of 2010. He had Bayern’s second clear chance, when volleying a delicious Iniesta chip at Neuer. Guardiola isn’t silly enough to encourage those two full-backs constantly, however, so an interesting feature of Bayern’s play was that the strikers split – Robert Lewandowski, as he often does, occupied the inside-left channel while Thomas Muller drifting in a wide-right position. This was even more exaggerated after half-time and made it more difficult for Barca’s full-backs to advance. Bayern’s good opportunities often came with these two combining – the peculiar chance in the first half, when Muller played a low cross to an unmarked Lewandowski, who completely miskicked, was a good example. At the other end, Barcelona were getting in behind less frequently. Messi and Suarez drifted around the pitch more, trying to find space, sometimes switching positions naturally rather than because of managerial instructions (Messi, of course, suggests that his return to a right-wing position happened in this manner anyway). 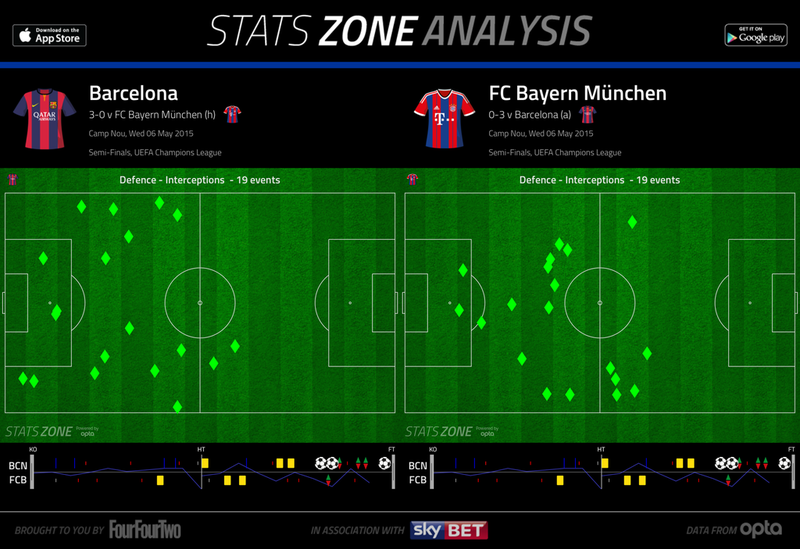 Bayern looked refreshed after the break, and a spell of heavy pressure meant they finally had a foothold on the game. Thiago was given more freedom to push higher up the pitch, and Bayern had lots of decent moments on the edge of the box without really creating clear-cut chances. During the middle part of the second half, though, the game went slightly flat. It was still high-tempo, but there was structure to the game, both teams had an adequate number of defenders behind the ball, and there was a brief stalemate – maybe a perfect opportunity for either manager to make one crucial change and win the game. 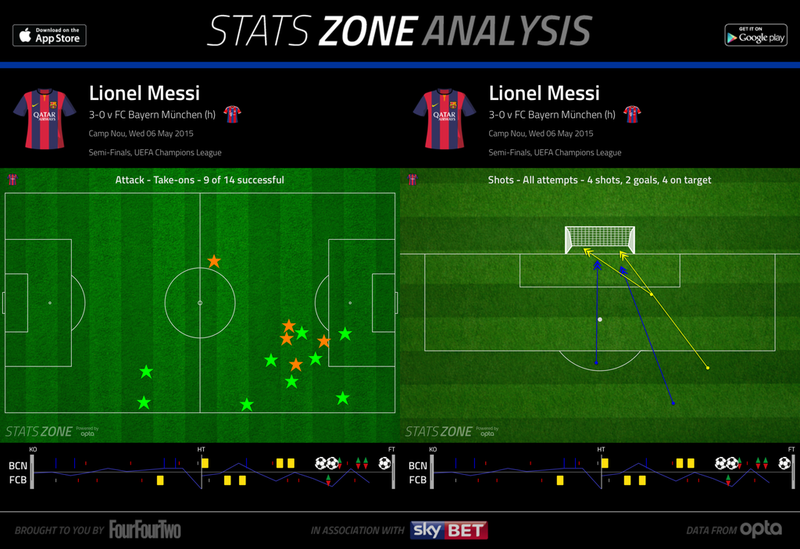 The change, though, came from the players already on the pitch, and two moments of brilliance from Messi. The goals were interesting tactically, though – first Bernat was caught in possession trying to dribble forward from left-back. 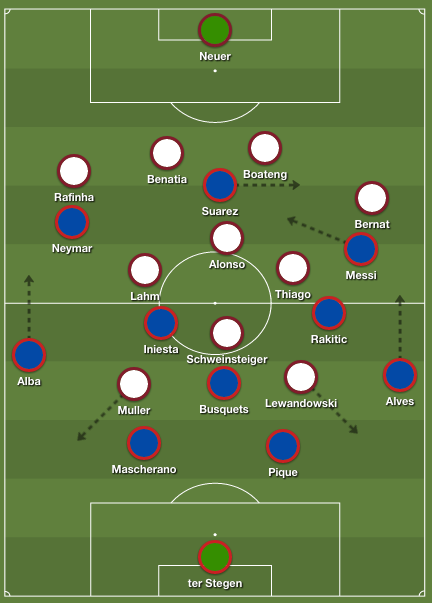 Alves pressed him to win possession (something he might not have been able to do without the freedom afforded by Bayern’s diamond – he didn’t have a winger to mark) and eventually Messi received possession and arrowed a shot past Neuer. Moments later Messi scored an even better goal – although again Bernant was culpable, getting caught out too high up the pitch. Messi moved in behind him, bamboozled Boateng and clipped the ball over Neuer for a sensational second. Guardiola went chasing the game. Some would say he should have settled for a 2-0 defeat, but clearly he wanted to take the risk, because at that point a goal was more valuable to Bayern than it was for Barca. Mario Gotze was summoned to replace Thomas Muller (although Guardiola could have brought Gotze on for a midfielder rather than a forward if he was being really attack-minded). Bayern pushed forward, left spaces at the back, and Messi teed up Neymar for the third – and probably decisive – goal. This was an unusual battle – the tactical interest came mainly within the first 15, the goals came in the final 15. 3-0 wasn’t an unfair reflection of the game, considering the number of chances the two sides created, but you would have expected the goals to have arrived in Barca’s main spell of dominance. The starting systems were the most interesting tactical aspect of the game. It’s hugely brave to play three-against-three when facing attackers of this calibre, and while Bayern survived the early onslaught at 0-0, it wasn’t a great advert for playing in this manner.